I am often asked the question: "What kind of rabbi are you?" My tongue firmly planted in my cheek, I usually answer: "A good one!" Of course, the questioner is trying to ascertain in which denomination of Judaism I affiliate and will then make a whole host of assumptions about me. Denominational labels, whether for rabbis or lay people, are thought to reveal such things as congregational affiliation, personal theology, daily practice, views on Israel, the role of women in Judaism, etc. However, we are now in a post-denominational age of modern Judaism and denominational labels have been rendered useless. We are in a time when Jewish people identify their religion in their Facebook profile as "Recon-newel-ortho-conserva-form." 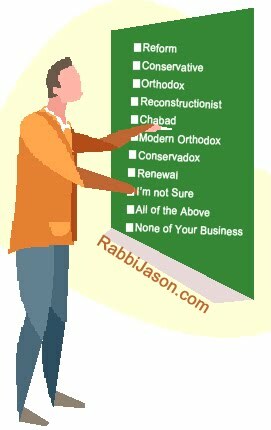 No, these people aren't confused about their Jewish identity, rather they have realized that there is "meaning" to be made from the various pathways to Torah. Rabbi Yitz Greenberg, when asked about the different streams of Judaism, remarked that this is the reason that Baskin Robbins offers thirty-one flavors of ice cream. And to this I would add that it's possible to order a mixture of flavors too. Yitz Greenberg also famously said, "I personally don't care which denomination in Judaism you belong to as long as you're ashamed of it." To those who ask what type of rabbi I am, perhaps a better response would be an invitation to sit and shmooze over coffee so that I may share my narrative. I was raised in the Conservative Movement attending Shabbat services, going to the synagogue pre-school, and studying at a Solomon Schechter Day School from kindergarten through the end of the seventh grade. In high school, I was active in the Conservative Movement's youth group, and traveled across the country and to Israel with other Conservative Jewish teens. When I decided to become a rabbi during my second year of college, there was never a doubt that it would be at the Jewish Theological Seminary in NYC, known as the flagship educational institution of the Conservative Movement. It was in rabbinical school, however, that I really came into contact with other "flavors" of Judaism. I was chosen for an interfaith dialogue program called Seminarians Interacting. We went on a week-long retreat and stayed at a Catholic seminary outside of Baltimore. I learned a bit about other faith traditions, but it was sharing a room with a Reform rabbinical student and talking to Reconstructionist rabbinical students that was the most eye-opening experience for me. We talked about our individual calling to become a rabbi, matters of belief and practice, and the future of the Jewish community. Not long after this experience, I returned to the Detroit area to spend a summer training as a hospital chaplain. There were Christian seminary students representing different denominations, but I spent the most time with a Reform rabbinical student who also attended that Conservative Jewish day school. We studied Torah together, prayed together, and debated Jewish law. It was wonderful. We each had our own "torah" to teach and we were both deeply engaged in learning from our rabbis, but we also gained so much from each other. It was also in rabbinical school that I become involved with Clal, a pluralistic organization that employs teaching fellows from every Jewish stream. In the Clal offices I found Reform, Conservative, Reconstructionist, and Orthodox scholars who were so deeply engrossed in discussing the issues of the day. It didn't matter where they prayed or how they thought the Torah was revealed to the Jewish people; all that mattered was that they could challenge each other to think outside of the box and help people make meaning out of their lives. Rabbinical School was a time when I prayed at an Orthodox shul in which men and women sat separately. But I also led a very Reform service on Friday nights for a nice group of thirty elderly people at the local nursing home. All the while spending my days studying Torah and Talmud in a Conservative seminary with professors who had all studied under Mordechai Kaplan, the founding father of Reconstructionist Judaism. After graduating from rabbinical school and becoming a card-carrying Conservative rabbi, I took a job at a Hillel foundation on a college campus. There, my job was to advise the leaders of the various student minyans, from Reform and Conservative to Humanistic and Traditional. I spent time in each of these different prayer groups and noticed that many students sampled the various offerings regardless of their upbringing or their family's affiliation. During this time, I also consulted a Conservative synagogue that didn't have a rabbi and taught adult education classes at a Reform temple. Today, I serve as the rabbi of a non-denominational camping agency in which I help run Shabbat services at our summer camp. The services tend more toward the Reform liturgy. I also serve as the part-time rabbi of a Reconstructionist congregation, and as the director of a consolidated, weekly high school program for the Conservative synagogues. I am part of two national rabbinic fellowship programs in which I learn and dialogue with rabbis from just about every Jewish flavor imaginable. When we come together at retreats, we forget at which institution we were each made into rabbis and just allow our Torah to permeate the room so that we may learn from each other. Whether with my colleagues at the STAR Foundation's PEER program or at Clal's Rabbis Without Borders, I've learned that if we perpetuate the arguments of whose Torah is true Judaism, we'll only do damage to the Jewish people. When we recognize that the labels don't help and that we're living in a post-denominational world we will be able to bring more of our collective Jewish wisdom to the world. I may find that my theology resonates the most with what has historically been considered a Conservative approach, but I still like to pray in an Orthodox minyan at times. The strong emphasis on social action in the Reform Movement motivates me to see the world beyond my nose and my responsibility to humanity. But the deep-rooted sense of a heimish community in the Orthodox world is something that I find gratifying and reaffirming. And the focus on egalitarianism and human dignity that has been critical to the Reconstructionist Movement since its inception is important to me. Conservative Jews are keeping Orthodox yeshivahs open with their generous philanthropy. Reform Jews are showing their strong support for Israel by becoming AIPAC leaders, traveling to Israel on solidarity missions, and planning community events to honor Israel -- all actions to which their Reform forebears would object. Orthodox synagogues are finding innovative ways to increase the role of women in the prayer service and in the community. And independent minyanim are forming around the country with no denominational affiliation and made up of young people who were raised in different traditions. So, the next time someone asks me what kind of rabbi I am, I think I'll just ask them: "Well, how much time do you have?" great article! shalom from mexico city. When it comes to theology (and ordination) I'm Conservative. When it comes to where I find the best davenning, I'm Orthodox. When it comes to my commitment to social action, I'm Reform. When it comes to my belief about the power of community, I'm Reconstructionist. One size does not fit all; but did it ever?? That's similar to what I wrote. I'm sure we could both take it even further and talk about aspects of other "flavors" of Judaism that we both like. I still refer to myself as a Conservative rabbi, a product of the Conservative Movement, and a Conservative Jew. However, I use those terms for identification purposes knowing full well that it will pigeon hole me in the minds of many. future. But it's clear that the connection between denominational education and denominational identification cannot be assumed anymore. As someone just setting her feet on the path to conversion, and feeling pulled toward many different ways in terms of belief and desire for observance, I appreciated reading this. You ought to look at Chabad Lubavitch.For a long time now they have reached out to Jews of all stripes and welcomed them all without sacrificing adherence to traditional Torah practices. Their huge success in attests to the sensibility of their approach. it is posssible to be open and traditional at the same time and to impact the world at large.